Indianapolis—The Indiana Historical Society is pleased to introduce Destination Indiana, a programmatic element of the Indiana Experience, a new way to live history that will open to the public March 20, 2010, at the Eugene and Marilyn Glick Indiana History Center. 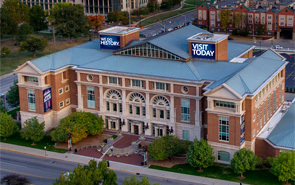 The History Center is located at 450 W. Ohio St. in downtown Indianapolis. Destination Indiana is a facilitated, interactive opportunity for visitors to “travel through time” using innovative digital technology, touch screens and immersive displays of historic images and documents to explore and understand the story of Indiana as a place. Making this experience possible are “journeys” that use engaging selections from the IHS’s extensive collections that include 1.6 million photographs and tens of thousands of other archival materials such as broadsides, manuscripts, maps, printed items and sheet music. A few journeys for 2010 will also include selected images from special partners. Destination Indiana features eight “drive yourself” time-travel stations that can each hold as many as six guests as well as a large group experience on its 22.5-foot by 7.5-foot screen, which features twice the resolution of a 1080i high-definition television set. The 2010 launch will include material for each of Indiana’s 92 counties. In addition to geographic options, 45 “Indiana Stories” on subject matters such as African-American Hoosiers, the Civil War, the Ohio River, mapping the state, social justice and reform, rail transportation and agriculture will also be explored. While journeys will typically include a dozen images apiece, research requires viewing and researching more than 20 images for each one actually used—IHS staff members will review more than 40,000 items on their way to writing narratives and creating the final product. Images used in Destination Indiana are available for viewing on the IHS’s Digital Image Collections Web page, http://images.indianahistory.org, where more than 37,000 IHS digital images are currently available online. An online catalog of all processed IHS collections material is available at www.indianahistory.org/library. Destination Indiana is sponsored by American Red Ball Transit Co. Inc. The Indiana Experience brings both the people of the state and visitors from around the world a uniquely Indiana experience. Interactive and high-technology experiences allow the IHS to share the tremendous archival holdings of the IHS, including 1.6 million photographs, in easy and enjoyable ways. Regular operating hours for the Indiana Experience and the William H. Smith Memorial Library are Tuesday through Saturday, 10 a.m. to 5 p.m. The Basile History Market is open Monday through Saturday, 10 a.m. to 5 p.m., and the Stardust Terrace Café is open Monday through Saturday, 10 a.m. to 4 p.m.
IHS members and children younger than five receive free admission to the Indiana Experience. Regular admission cost is $7 for adults, $6.50 for seniors (60 and older) and $5 per child (ages five to 17). 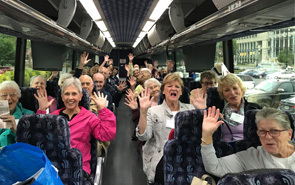 Group rates for adults, seniors and students are available. Admission to the William H. Smith Memorial Library, Basile History Market and Stardust Terrace Café is free. Parking is complimentary for members visiting the History Center, with paid admission to the Indiana Experience, for patrons of the William H. Smith Memorial Library and/or with a $7 purchase at the Stardust Terrace Café or Basile History Market. Since 1830, the Indiana Historical Society has been Indiana’s Storyteller™, connecting people to the past by collecting, preserving, interpreting and sharing the state’s history. A private, nonprofit membership organization, IHS maintains the nation’s premier research library and archives on the history of Indiana and the Old Northwest. IHS also provides support and assistance to local museums and historical groups, publishes books and periodicals; sponsors teacher workshops; and provides youth, adult and family programming. To receive an electronic copy of this press release, more information and/or images, or to schedule an interview, please contact Amy Lamb, Media Relations Manager, at (317) 232-1878 or alamb@indianahistory.org.